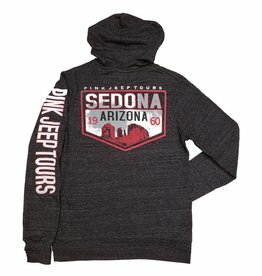 Heavy weight hooded sweatshirt with Sedona AZ Pink Jeep Tours Logo. 50% Cotton and 50% Polyester blend. Heavy weight hooded sweatshirt with You Gotta Do It Pink Jeep Tours Logo on the front. 50% Cotton and 50% Polyester blend. 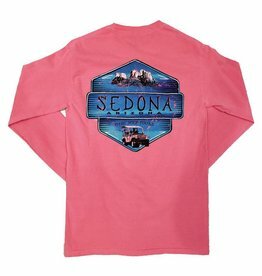 Light weight hooded t-shirt with Sedona Cathedral Rock design on the front and back, and Pink Jeep Tours written down the left sleeve. 50% Polyester 37% Cotton 13% Rayon. Light weight tri-blend hooded t-shirt with custom hand crafted Pink Jeep Tours bling design. 50% Polyester 37% Cotton 13% Rayon. 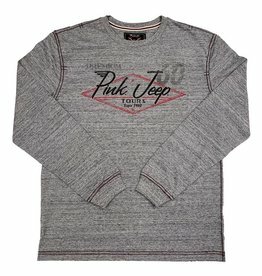 Stawberry Ice long sleeved t-shirt with Sedona Cathedral Rock design on the back and Pink Jeep Tours logo on the front. 100% Cotton. 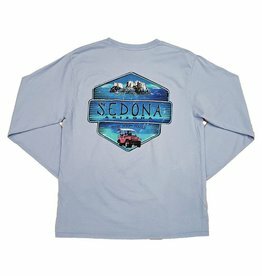 Cornflower Blue long sleeved t-shirt with Sedona Cathedral Rock design on the back and Pink Jeep Tours logo on the front. Ringspun 100% Cotton. Suede long sleeved tee with granite body and Tibetan red sleeves. 60% Cotton 40% Polyester. Soft to the touch. 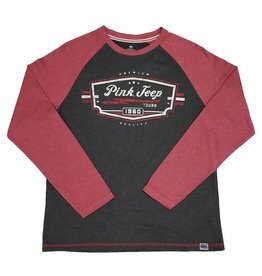 Iron Needle Steel Heather long sleeved tee. Specially reinforced with iron needle stitching. Premium weight 60% Cotton 40% polyester. Short sleeved t-shirt with You Gotta Do It Pink Jeep Tours Logo on the front and back. 50% Cotton and 50% Polyester blend.